Today, I’m going to teach you how to use local MLM events, such as trade shows, bazaars, and festivals to grow your network marketing business. Local events are a wonderful way to grow your network marketing business. This includes craft fairs, trade shows, festivals, BBQ cook-offs, special events, farmer’s markets, health fairs, seasonal events, local fairs, etc. The beauty of events is that people come to you! People approach your booth and ask you more about your products and what you do. To me, that’s 100 times better than chasing people or approaching strangers. What do you think? Depending on the event, you can meet hundreds, even thousands of people who might be interested in learning more about what you have to offer. Your job is to be organized, have a good game plan, and work smart. Think of yourself as an information provider and ambassador to your company, not some slick salesperson. My goal in this post is to share some of my best tips with you that I learned from an event today. I’m by no means and expert on events yet, but I want to share what I learned today and what I recommend you do if you are just starting out. I hope it helps. 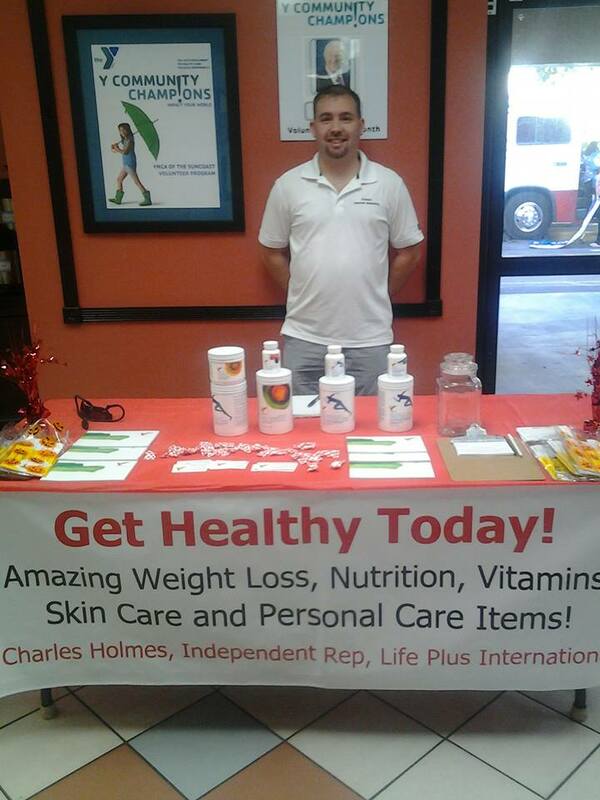 One of my team members and I rented a table/booth today at the YMCA in Spring Hill, Florida. 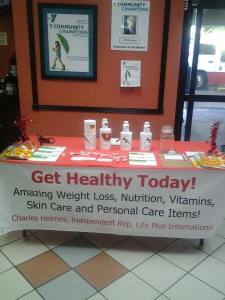 It was a Health Fair for women in celebration of Breast Cancer Awareness Month. The event was three hours long and was located inside of the YMCA building. We were given a table and we had about an hour to set up from 8 am to 9 am. The event went from 9 am to 12 pm. We received lots of foot traffic by giving away free samples and by being friendly with everyone who walked by. Our goal was not to sell our products or pitch our business, but to collect leads by doing a raffle. I offered a free $55 product to get people to participate in the free raffle. They had to fill out a pre-made card with their contact information to be eligible for the raffle. We also wanted to hand out a bunch of information packets to introduce more people to the products and business opportunity. The information packets had a flyer, business card, a couple of postcards/sizzle cards, and a piece of candy. I haven’t tallied the leads yet from the raffle yet, but I’d bet I handed out 80 to 90 information packets and about 100 business cards. Considering this was my first event, it was close to home, and it was priced right (just $20) I thought it was a good use of my time. I’ll know within a few weeks what type of return on investment I got from the event, after I’ve followed up with everyone. Overall, I enjoyed the experience. It was nice to be social, to meet new people, and to connect with the other vendors. I will definitely do more events in the future to promote my MLM Business. What Type of Events Should You Consider? If you offer a mass market type of product or service like I do, you could attend just about any event and find plenty of prospects. On the other hand, if your product line is specialized, you really want to focus in on an event where people are part of your niche market. I would encourage you to check your local area and see what you can find. If nothing else, try out a few different local MLM events and see if it is a good fit for you. You’ll never know until you try. Thanks to my experience in the Army, I’m a big fan of checklists. Here is a list of everything I had with me at the event, or wish I had brought with me. It might not be a 100% comprehensive list, but it’s at least a good starting point. # 1 Focus on Getting Leads – Trying to make sales and recruit people at the event is one strategy. Yes, that is your ultimate goal. But your primary goal at the event should be to get leads. Most people will not buy from you the first time they meet you, let alone join your team as a distributor right away. That’s why you want to collect as many names, emails and phone numbers as possible, so you can follow up with the folks after the event. # 2 Do a Raffle – Everyone likes a chance to win something for free! Don’t you? Why not do a raffle for one of your products? Make it a good product in the $30 to $75 price range. That way people have a good incentive to participate in the raffle. On your raffle entry, have a section for people to check off if they are interested in learning more about the products or business opportunity. Have one winner and then call or email everyone else and tell them they won second prize. For second prize offer everyone a $10 discount off their first order. This is a great way to convert more of your leads into customers. # 3 Give Away Something for Free – This one goes hand in hand with the raffle. Everyone likes something for free. Give away a free sample, a free information pack, or something that people actually WANT to take. Use this as a lead generator. Make sure you include your business card with each giveaway. Also, make sure you get the person’s contact information (name, phone and email) in exchange for accepting the free information. # 4 Be Friendly – Don’t be one of those folks who just sits at your table and waits for people to initiate a conversation with you. Say hello to everyone. Put a smile on your face, stand up, and be friendly. This will naturally attract people to your booth. I can’t believe some vendors actually ignore their prospect by just sitting there staring at their cell phone. If you aren’t willing to talk to people don’t go! In most cases, you’ll need to initiate the conversations with your prospects. # 5 Get Organized – Make sure you are organized the night before the event. Use the checklist that I provided above and make a “to-do” list so you don’t forget anything important. Make sure you have enough supplies, product samples, and business cards. You don’t want to run out of these things during the event. Spend a few hours preparing ahead of time and it will really pay off. # 6 Bring a Helper – If possible, bring a helper with you to all of your local MLM events! Bring your spouse, child, or someone on your team who knows what they are talking about, and is willing to help. Working with a team member is ideal because you can split the cost of the event and the leads. If the event brings in a lot of foot traffic you will be busy, and it will be nice to have someone with you who can help you. In addition, if you need to take a quick restroom break you can! # 7 Connect with Other Vendors – The BEST prospects at the event are other vendors. They are entrepreneurial by nature or they wouldn’t be there in the first place! Make sure you have a little information packet or gift for all of the vendors. Walk to each of their booths, introduce yourself and give them their gift. Try to get a business card from all of the vendors, so you can follow up with them at a future date. # 8 Dress Nice – You don’t need to wear a three piece suit, but make sure you dress to impress. Try to take in consideration what most of the visitors will be wearing and wear something a little bit nicer. If in doubt, khaki pants and a polo-shirt, or business casual is normally a good pick. Don’t wear sweat pants or yoga pants. Make sure you brush your teeth and don’t wear worn out, ripped clothing. Remember, you want to look like a professional. # 9 Follow Up – The money is in the follow up. I’ve said that countless times on this website. Make sure that you call all of your leads within 24-48 hours. You can also email them to follow up. Being prompt is vital. If you aren’t willing to follow up with people you shouldn’t even go to the event in the first place. The bottom line is that local MLM events, such as bazaars, festivals, and health fairs are a great way to promote your network marketing business. The absolute best part is that people approach you. Ideally, you want to find an event where most of the attendees are people in your target market. At the event, you want to be friendly and social. Don’t try to pitch and sell everyone. Share information, hand out samples, educate your prospect and collect leads. 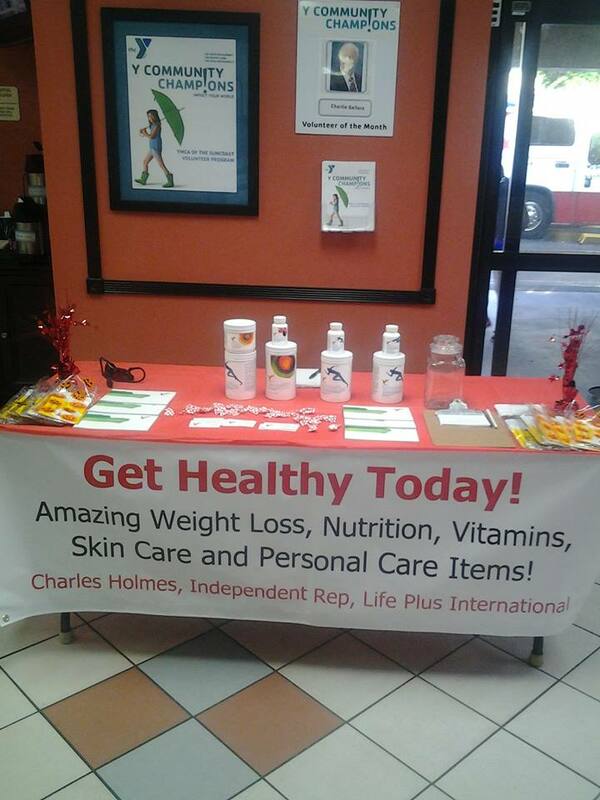 At the end of the event follow up promptly and take orders and sign up new distributors. What are your thoughts? What type of success have you had promoting your network marketing business at bazaars, festivals, shows and other local events? Leave a comment below to share any tips you have that might help others succeed. I look forward to hearing from you. I was curious Chuck, did you sell any products at this show? In my opinion, it is a great idea to have some products available to sell, but the priority should be in getting leads. It seems like a person could find opportunities to do this kind of marketing on a weekly basis. Here in Puerto Rico, a person could find things like flea markets, farmer’s markets, artists displays and more on a daily basis. It is probably similar almost anywhere. Great post and tips Chuck. I didn’t try to make sales. I focused on collecting leads. Wow. Very interesting concept. I have never considered this approach and I am not really sure why. I guess I just have to find some events where my products would best fit in and I would be able to attract my target market. Otherwise, I suspect I would be wasting my time. But if in the right venue I can see that you would draw a lot of foot traffic which could be great for the company. Thanks! Yes, local events can work very well if you do a bunch of them and have a good game plan. What a great idea. As a person who often is looking for places to sell our books and literature, this idea is great. I also like what you said about the banner. I had considered a banner once, but the local prices are astronomical. I about fell out of my chair when you said you had it done on Ebay for $20. Maggie and I have outfits we could wear at things like this. Since our books are about Puerto Rico, she has a Boricua dress and I have an Uncle Sam outfit. I mention this because having a “prop” such as this can gain a lot of attention. Thanks for the ideas Chuck. I never thought about using a prop. That would definitely bring more people over to your booth. “Think of yourself as an information provider and an ambassador to your company, not as a salesman.” This quote emphasizes the importance of not pushing sales, but pushing information and knowledge. A public event (bazaar, fair, festival, trade show, etc) allows you to do this more easy than in any other circumstance. These events are set up with the intention of encouraging people to come and talk to you! You don’t need to push anything, you don’t need to chase anyone. If what you’ve got at your booth is intriguing to passersby, they’ll come to you. Once you’ve got their attention, you can push your information and hopefully it’ll strike a tone with them. These kinds of events are a cost-effective way to push your MLM business in a very casual, non-intrusive manner. Treat people well. Educate them. Help them solve their problems. Do that and you will get more sales than you know what to do with. You had mentioned that you were going to be doing this event in a call earlier this summer. I am glad it went well. This post generated so many questions, but i will start with a question is about the banner you had draping the table. Did you design it and have it printed or is that something you bought through your MLM company? If you had it printed, where did you have it done (national chain like Staples, local sign shop, internet company like Vistaprint)? Got the banner done on eBay for $20 with free shipping. I was going to have one made at the local office supply store, but their cost was more than $100. Since I buy most things on eBay, I just typed in custom banner and then did a search from lowest to highest. I would suggest you do the same.